One of the most unique and delicious dinners I’ve made recently is cauliflower crust pizza—that is, pizza crust made from cauliflower. If you’ve been reading recently, then you’ve already seen my recipe for Cauliflower Crust Pizza, which I made with egg and mozzarella cheese (and topped with my delicious Balsamic-Glazed Onions and Peppers!). Since that turned out so well, I was eager to try a vegan version, using my recipe for Chia Egg Replacer and my favorite vegan mozzarella, by Daiya. And the result was both stunning and ridiculously delish. 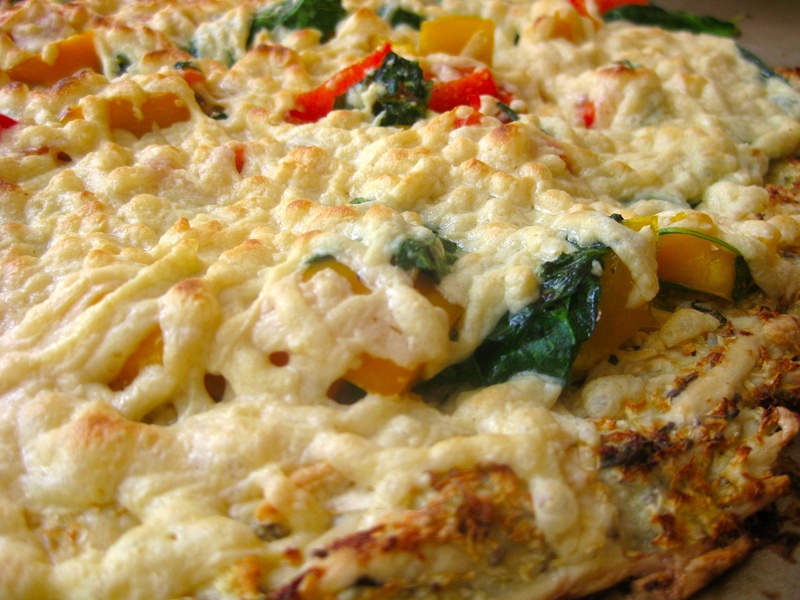 If you are vegan, veggie, or just want to add more veg*n foods to your diet, I can’t recommend Daiya cheezes enough! They not only taste like real, dairy cheese, they also melt! I was vegan for four years and during that time, I tried just about every vegan cheeze on the market, mostly to my dismay. Daiya is like a vegan savior. Seriously, you’ve got to try it. So! For this variation on the cauliflower crust pizza, all I did was swap out the egg for chia egg replacer and the mozzarella for Daiya. 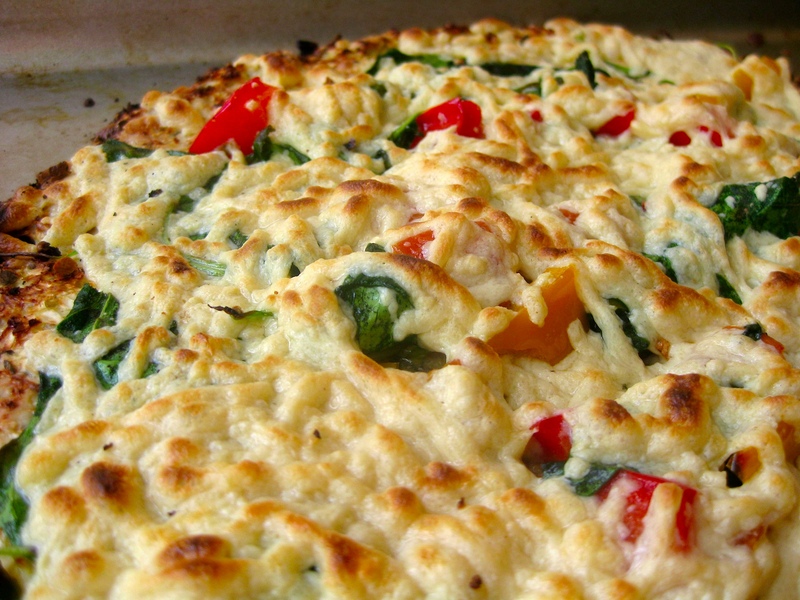 Once the crust was cooked, I topped it with some chopped peppers and arugula… and more Daiya. Then broiled it for 5 minutes and chowed down! Chop cauliflower into chunks. In a blender or food processor, pulse the cauliflower until “riced” or very small pieces. If you don’t have a food processor, you can also use a grater. 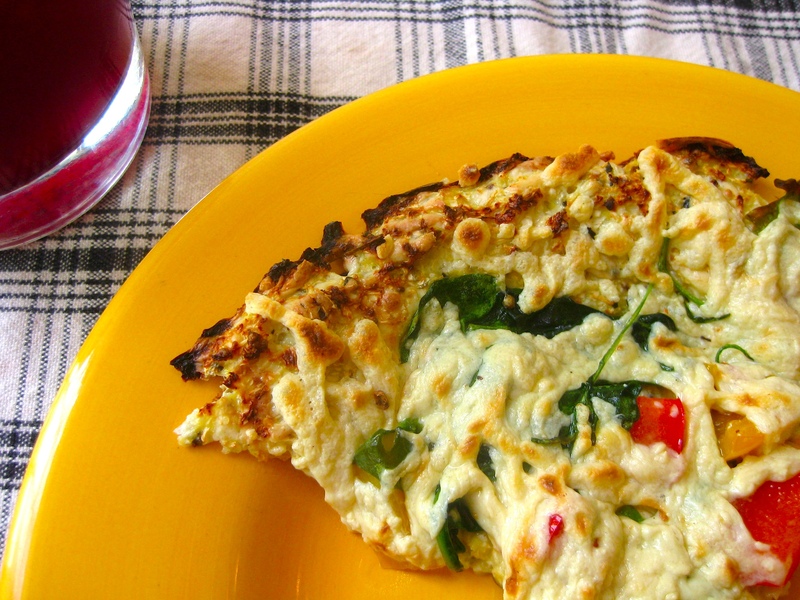 Sautee the cauliflower in a tiny bit of olive oil in a large skillet for 6–8 minutes or until translucent. Transfer the cauliflower to a medium bowl. Mix in all the other ingredients and stir well. Bake at 400F for 25–30 minutes until golden. Remove from the oven and add your toppings. Cool 2–3 minutes, then cut and serve immediately. Enjoy! 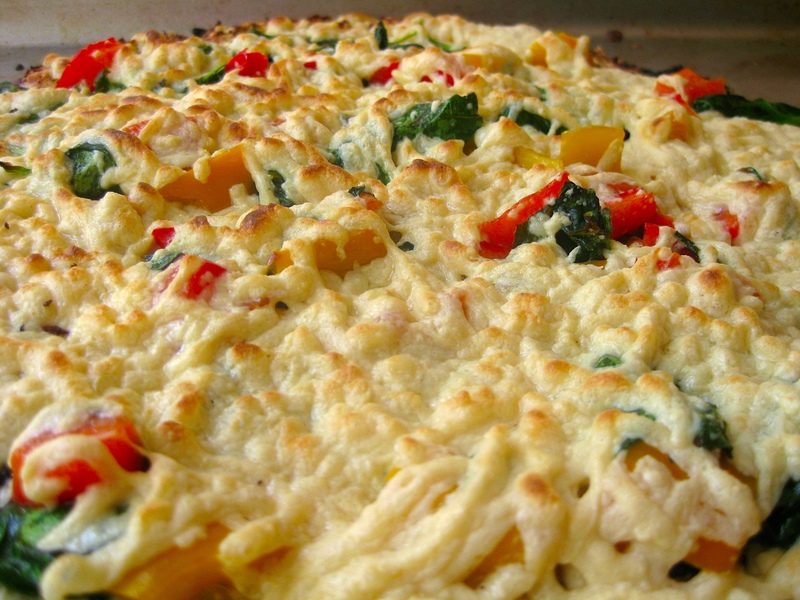 Have you ever made a cauliflower crust pizza? Do you have a favorite pizza topping? This looks to die for!!! Awwww, yeaaahhhh. It WAS! 🙂 Make it, girl! You’d love it! I am so going to make this. This looks YUMMERS!!!!!!!!!!!!!!! I made this tonight. And while it was unbelievably delicious (I topped it with roasted balsamic marinated red onions and portabello mushrooms as well as fresh spinach and tomatoes) the middle of it never hardened up. The outsides got crispy but the middle of the crust never did even though I baked it for 30 minutes prior to putting the toppings on. Any ideas? I put it on parchment paper and when I took the parchment paper off of the cookie sheet there was moisture underneath. Try making smaller personal size pizza crusts…then the fam can create their own and they’ll cook through for sure! When you sautee the cauliflower, try doing it without the oil as the cauliflower will release a lot of water. Then transfer the cooked cauliflower to a clean cotton or linen towel and squeeze some of the moisture out. This will help give you a dryer crust that will (most likely) set up in the middle. If that sounds like too much work, try using a pizza stone or even transferring the pizza straight to the oven’s wire rack about halfway through the cooking process. I’m just getting around to trying this. Mine didn’t harden up either, but it was delicious none the less. I’ll definitely make this again.